Head posture- Is the orange in your lap? 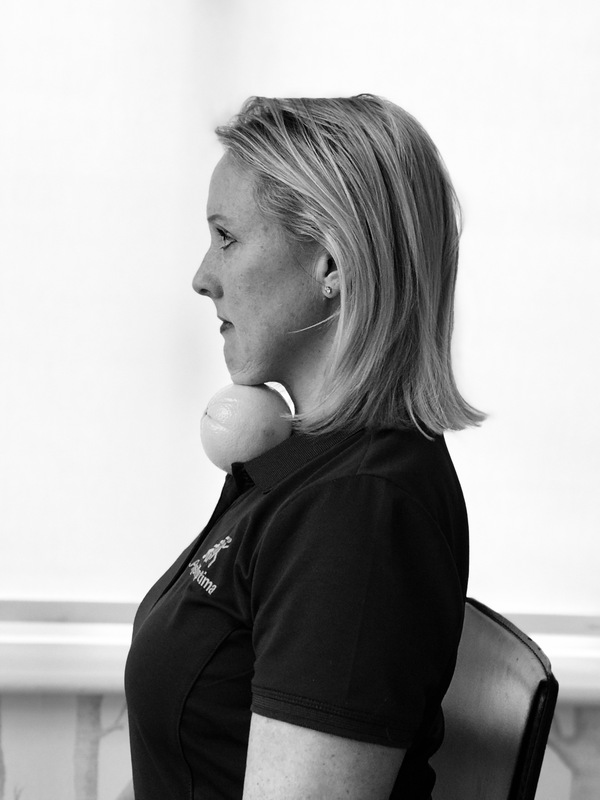 How we hold our head on a day-to-day basis, whether at work or at home can greatly impact our posture- both short term and long term. A bad head posture with the head drawn forward is what a lot of us find ourselves doing as we peer into our computer screens, phones, whilst driving, cycling and even reading. In physio terms, I like to refer to this bad head posture as the “Pokey Chin Syndrome”. In ideal alignment, we should aim to keep our head squarely over our trunk, lifted gently through the back of the neck and with our chin very gently nodded down and drawn in. With my patients I regularly use the analogy of holding an imaginary orange between their chin and their chest. If the orange has fallen into your lap, then you are too far forward! And you are falling victim to the “Pokey Chin Syndrome”! If you look at the anatomy of the head and neck, and consider pure physics, it makes complete sense. The neck is a “thin stalk” with a very large “bowling ball”, weighing 10-11 pounds, perched on top. Just like you wouldn’t want to hold a bowling ball out in front of your body dangling from your thin wrist for too long, neither does your neck appreciate your head hanging out front either! Shortening the lever by bringing the head over the trunk, and centering the weight of your head directly above the “thin stalk” or your neck, makes all the neck structures under less stress and strain. So in the short term, if you don’t let the “orange fall into your lap” you will suffer less muscle tension, neck stiffness and postural pain. In the long term, you will prevent soft tissue changes, bone and cartilage wear and tear (osteoarthritis), fixed scoliosis or kyphosis (hunched back) from developing, and nerve compression (or pinched nerves). By adopting a simple mantra of “keep my orange from falling into my lap!”, you will do wonders for your posture and spinal health. And here is a simple desk exercise to reverse effects of Pokey Chin Syndrome. Any questions, do not hesitate to ask anyone on our PhysiOptima team. Dumb Waiter or Smart One? Roll in New Year with Good Health! Desk Posture Getting to You? What Causes Plantar Fasciitis or Heel Pain? Do only Golfers get “Golfer’s Elbow”? Help – My Neck Has Seized Up!